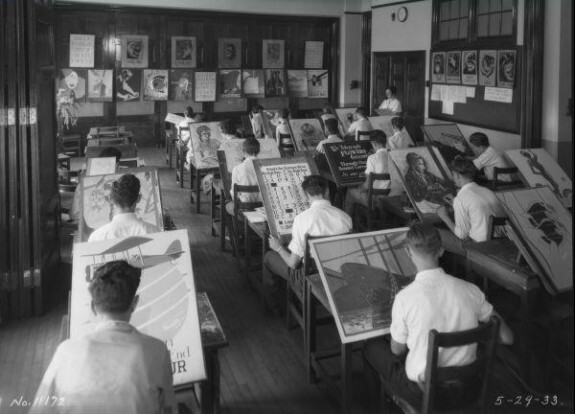 As many of Philadelphia's public schools cut programs during the Great Depression in their struggle to stay open, sights such as this art class at the Logan Demonstration School in 1933 became rare. The Logan Demonstration School acted as an institution for teachers around the Greater Philadelphia area to learn and develop new techniques as part of their education. The school, located at Seventeenth Street and Lindley Avenue in the city’s Logan section, is now known as James Logan Elementary School. Before becoming superintendent of the Philadelphia public school system in 1906, Martin G. Brumbaugh was a prominent member of the education and teaching community for more than twenty years. After growing up on his family's farm in Huntingdon County, Pennsylvania, Brumbaugh received his teaching certification from Brethren Normal School (later named Juniata College) and became the superintendent of the Huntington County public school system. He also ran multiple teaching institutes in Louisiana in the 1880s. Brumbaugh became president of the Juniata College soon after earning his Ph.D. in education from the University of Pennsylvania in 1894, then left the position in 1900 to become the commissioner of education in Puerto Rico. By 1902, Brumbaugh developed a popular series of educational books called the Brumbaugh Standard Readers, which taught children reading, writing, and arithmetic with patriotic themes. 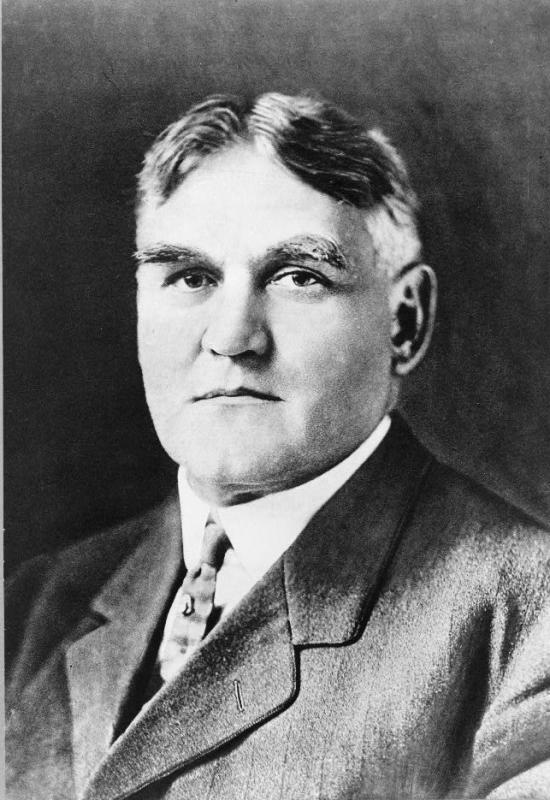 Brumbaugh became the superintendent of Philadelphia's public school system in 1906 and drastically reorganized the ways schools operated and taught children by building additional primary and secondary schools, reforming academic programs in the high schools, and raising teacher salaries. Brumbaugh served as the superintendent of the Philadelphia School District until 1914, when he ran a successful campaign to become governor of Pennsylvania. This image of Brumbaugh was taken in 1914 as part of the election campaign. 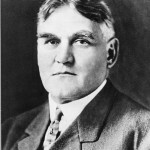 After Brumbaugh's term ended in 1919, he became the president of Juniata College again from 1924 until his death in 1930. More than forty elementary and secondary schools were built during the tenure of Philadelphia school system Superintendent Martin G. Brumbaugh from 1906-1915. 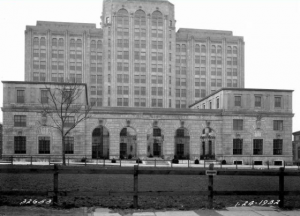 The Thomas Durham Elementary School, located at Sixteenth and Lombard streets, was part of Brumbaugh's push to create more institutions for the children of Philadelphia. The school was named after Thomas Durham, who was president and director of the seventh section (bordered by South, Spruce, Seventh, and Twenty-Second streets) of the Philadelphia School District throughout the 1880s and 1890s. 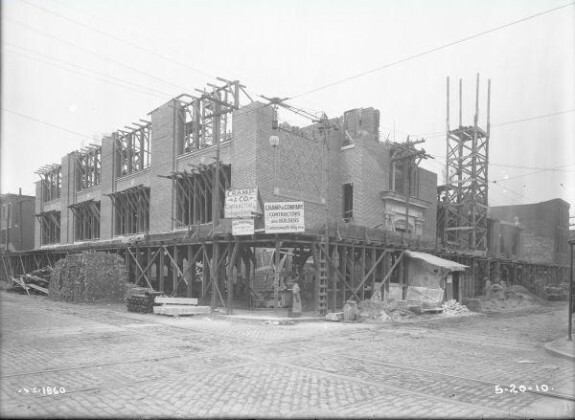 Construction began in the fall of 1909 and the school opened to students in November 1910. 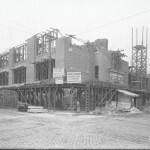 This image of the building during construction is from May 1910. The school became part of the National Register of Historic Places in 1988, but closed as a public school in the 1990s. The school became the Independence Charter School in 2001. Although Philadelphia's Board of Education passed a resolution in 1959 against discrimination based on race, many of Philadelphia's schools remained segregated. Philadelphia's public schools were predominantly African American in the 1960s and had to conform to curricula and policies established by white educational leaders. In 1967, around 3,500 Philadelphia high school students walked out of their classes and staged a demonstration in front of the Board of Public Education, pictured here on Twenty-First Street and Benjamin Franklin Parkway. The demonstrators urged the district to adopt a more Afrocentric curriculum, teach black history, and rename some high schools after prominent African American leaders. Police Commissioner Frank Rizzo ordered two buses of police officers to watch over the peaceful demonstration and later use force to quash it. Twenty-two people were injured in front of the School Board building and 57 people were arrested. Some arrests occurred when students left Twenty-First Street and vandalized cars and other property as they fanned out into the surrounding neighborhood and the downtown shopping district. Before Pennsylvania state legislators passed the Reorganization Act of 1905 and Martin G. Brumbaugh (1862-1930) became Philadelphia’s school superintendent in 1906, corrupt budgetary and hiring practices plagued the School District of Philadelphia. Under Brumbaugh’s guidance, the board of education replaced its ward-based governance system with one that gave the superintendent the power to systematize and standardize the public schools. As superintendent, Brumbaugh obtained public funds to build additional primary and secondary schools, reform academic programs in the high schools, and raise teacher salaries. These policies increased access to educational institutions for Philadelphia youth, particularly those living in West Philadelphia, Frankford, and Germantown—beyond the city’s core—and alleviated overcrowding and part-time attendance patterns in the city’s primary schools. At the same time, the Archdiocese of Philadelphia expanded its school system to attract families who wanted their children to attend Catholic schools. These policies increased racial segregation in the city’s schools as white ethnics—primarily Italians and Irish—enrolled their children in parochial schools. African American families never enjoyed the same educational opportunities. For decades, the School District of Philadelphia maintained specific policies and informal practices that segregated black and white youth and discriminated against black teachers. African American leaders and concerned residents challenged these racist practices by forming grassroots organizations, such as the Educational Equality League, and mounting fundraising campaigns through the city’s black newspaper, the Philadelphia Tribune. World War II brought Philadelphia’s economy back to life—at least temporarily. 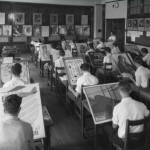 The School District of Philadelphia created accelerated secondary school programs so that students could earn their diplomas before enlisting in the nation’s armed services or securing employment in a variety of wartime industries. As families moved to the region to find work and as youth returned to the labor market, student enrollment decreased at the secondary level even as it increased in elementary schools. 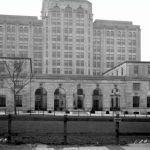 The School District of Philadelphia did not have the budget or the resources to build new schools during the war, and thus primary school children, particularly African Americans, found that racial segregation in the region’s housing market barred them from the best schooling options. As this suburban expansion and white flight from the city occurred, urban public schools systems like Philadelphia’s lost the tax revenues that white families had contributed. They also witnessed a dramatic increase in the number of black youth in the public schools. This combination, coupled with the Philadelphia City Council’s failure to raise the revenues the schools actually needed, created an untenable situation. The school district could not hire enough teachers or build enough new schools. When they did find the land and money to build new schools, these new institutions often reinforced inequality by creating distinct schools for black children in North Philadelphia and white children in predominately middle-class white communities such as Mount Airy and Overbrook. The school district’s policies and practices often left African American children in schools that were much more crowded than those attended by their white counterparts. School choice played a role, as well, as white Catholic families sent their children to parochial schools rather than their local public schools. The pressure to desegregate mounted after the United States Supreme Court’s decision in Brown v. Board of Education (1954), which stipulated that separate but equal educational institutions were unconstitutional. Civil rights activists in Philadelphia and suburbs like Abington, Pennsylvania, and Mount Holly, New Jersey, called for the desegregation of public schools. But those in charge of those schools routinely replied that the conditions were beyond their control. In 1959, Philadelphia’s Board of Public Education passed a resolution stating that the school district did not discriminate against anyone on the basis of race, color, religion, or national origin. Civil rights leaders pressed the board to do more, and in the mid-1960s, the school district finally admitted that Philadelphia’s public schools were indeed segregated. It commissioned several studies, such as the Report of the Special Committee on Nondiscrimination (sometimes referred to as the “Lewis Report” for the committee’s chairman, board Vice President Ada H. Lewis) whose findings the district’s leaders largely ignored. In 1967, Philadelphia youth staged a demonstration to urge the district to adopt black history and a more Afrocentric curriculum. When Police Commissioner Frank Rizzo ordered his officers to use brutal force to quash this peaceful demonstration, it became more apparent than ever that equal educational opportunity was not a reality in Philadelphia. Clapper, Michael. 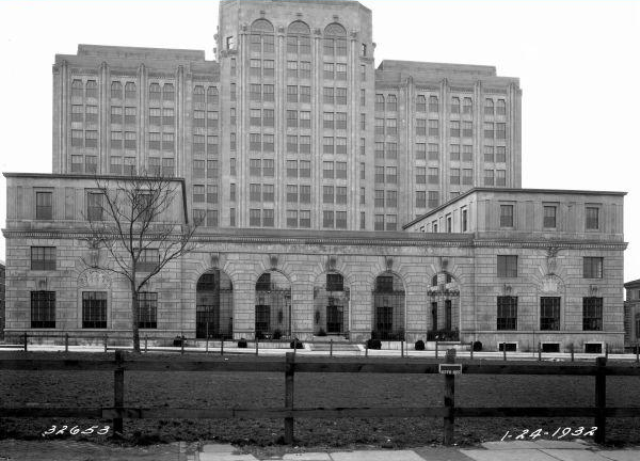 “The Constructed World of Postwar Philadelphia Area Schools: Site Selection, Architecture, and the Landscape of Inequality.” Ph.D. Dissertation, University of Pennsylvania, 2008. Issel, William H. “Modernization in Philadelphia School Reform, 1882-1905.” The Pennsylvania Magazine of History and Biography 94, no. 3 (July 1970): 358–383. Katz, Michael B., Mark J. Stern, and Jamie J. Fader. “The New African American Inequality.” The Journal of American History 92, no. 1 (June 1, 2005): 75–108. Labaree, David F. The Making of an American High School: The Credentials Market and Central High of Philadelphia, 1838-1939. New Haven: Yale University Press, 1988. Neckerman, Kathryn M. Schools Betrayed: Roots of Failure in Inner-City Education. Chicago: University of Chicago Press, 2007. Phillips, Anne E. “A History of the Struggle for School Desegregation in Philadelphia.” Pennsylvania History 72, no. 1 (Winter 2005): 49–76. Thank you for this very informative and insightful article into the dark and shameful operations of the Philadelphia Public Schools System. I myself, lived in South Philadelphia as a child. Living in a black neighborhood,my elementary school was a segregated school. Upon going to a junior high with a large gang population,my parents appealed to then Congressman Bill Barrett,to arrange for me to go to Vare Junior High,which was located in the mostly Italian part of South Philadelphia. It was my first contact with white students. I did observe that a lot of other black students also attended Vare. This was in the early’60′s. It seems that unless black parents made the effort to send their kids to a more integrated school,the majority of the black children were shipped en masse to the targeted black junior high schools. This situation became more fluid by the mid and late ’60′s. Students in my neighborhood,could attend pretty much any school their parents wished to send them.